An open letter from Blue Angel 7. On the eve of our third Independence Day Air Show, I came to realize how far we have come as a squadron and why we managed to get here. Each year we are presented new challenges and at each turn we fight the demons that live in the clouds as much as those living in our souls. How each of us handles that reality and keeps pushing the envelope to the extent our lives and limitations allow it is what defines us as mirrors of the Navy Flight Demonstration Squadron in Second Life. Here we are again, standing tall and humbled by those who like ourselves fly the skies of this virtual world in ways most people never will, pressing on at each practice and demonstration to achieve what lies ahead seemingly in our reach but yet unreachable: the perfect demo. In ways that resemble real life aerobatic flight more than you'd expect, we go up every time facing many adverse factors that range from our physical and mental shape, the state our aircraft is in and this virtual world's conditions - that we call "weather" in jest. And Second Life has some nasty weather as you well know. But we keep going up again and again and that's part of the envelope we choose to push, just as our own limits are. So add all these factors up and you understand being a demo pilot is not for everyone. Now, on top of all that, add the fact that we as Blue Angels represent the finest naval aviation squadron in the United States Navy. Any real life naval aviator who had the privilege of flying a blue and gold jet will tell you that the Blue Angels is one of the most democratic units in the military, due to its exclusive nature and the close bonds that exist among their pilots and crew. But they will also tell you that the time they spent with the Blues was perhaps the hardest in their military careers, albeit the most rewarding and exciting period in them. 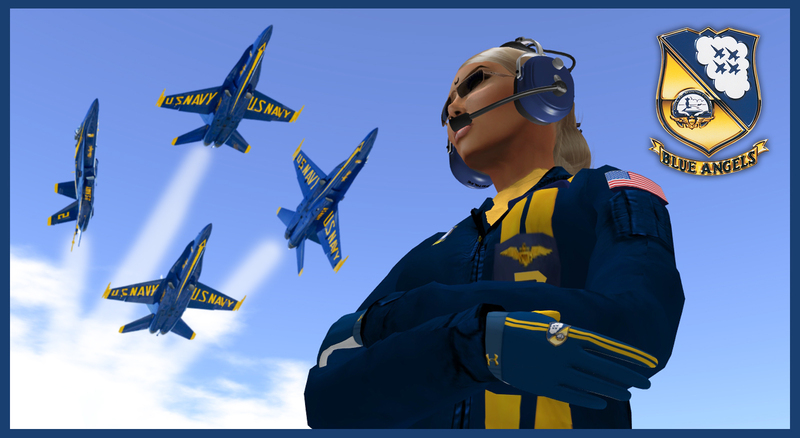 In Second Life, we proudly follow that tradition and stay true to the Blue Angels (and U.S. Navy) values of Honor, Courage and Commitment. This simply means that we carry ourselves as a naval officer would while enduring all the challenges our choice brings with it. The success rate of a Blue Angels candidate in our squadron is 20%. Out of every 10 candidates, only 2 make it past internship and the first year as a newbie with the demo team. They all know what is expected of them and what the conditions are - there are no surprises. All the veteran Blues in the squadron have been flying under those exact same conditions for years and any of them can tell you that as far as the squadron is concerned we remain the same. The same in our way of portraying a Blue Angels demo pilot, the same in our way of tackling the obstacles that come before us and the same as individuals. Through the years we became a very tight group, and to become a part of it is one of the many hurdles a Blues candidate has to overcome, and after internship, when all of the commissioned Blue Angels vote to let someone in, that hurdle is often still to be faced. Under these circumstances it was no surprise to me that in a period of practically 30 days, recently, two interns and two newbies decided to resign from the squadron. I was however, disappointed. It always hurts to see someone give up after all the work and effort you put into helping him or her, but it is thanks to that process that we keep our standards as high as they are. And when you keep standards high, chances are some will drop out when they realize they are not getting any lower. It is just a fact of life, even if second life. I am very proud of my fellow virtual naval aviators in the Navy Flight Demonstration Team, veterans and newbies, and to the best of my abilities will keep on working with them to make us better each day, just as they do. And in doing so, I sincerely hope that we can carry on this great tradition and remain the ambassadors of the United States Navy in this virtual world, much like the true Blues do in the real one. It has been my honor and privilege to be one of the keepers of this flame for the last two and a half years. May it shine ever bright in the ones to come. "Very Well Stated"! Go Navy! Go Blues! Thank you, Ypaetea! See you at SLCI for our next Air Show!